Even if letters are properly formed, written material cannot be deciphered if it is poorly organized on the page. This kit is a great way to teach writing organization and legibility. The author has broken down the skills needed to achieve legibility into 9 components: letter formation, correct use of capital, placement on the lines, punctuation, use of margins, paragraph indentation, word spacing, all-over legibility and adequate speed. Each component is described in the book and depicted on 9 separate laminated pages for the student to put a smile or frown on Willy the Worm. Students are taught a self-check system to evaluate their own progress. Kit includes the teaching aids needed for the program and 9 laminated sheets, all in a large, convenient, reuseable plastic envelope . Use during the early stages of learning to write sentences or at any subsequent time. 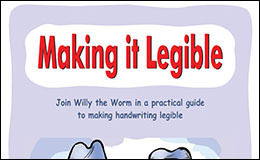 A MUST for anyone working with children on handwriting - occupational therapists, teachers and parents!